The domestic watermelon season is still a month away, but growers are already preparing their crops for the upcoming season. Frey Farms is a family farm that grows produce, including watermelons, in several US states stretching from South Florida, throughout the Southeast up into the Midwest. The business is a Certified Woman Owned Business founded by Sarah Frey, and they're getting ready for their first watermelons of the year from Florida. "We're about 30 - 40 days out from harvesting our first watermelons for the year," said Sarah Frey. "It's our first domestic crop of the season and will begin in LaBelle, South Florida. From there production steadily moves north into Georgia and eventually to the Midwest for our Fall crops in southern Indiana." Back in 2014, Frey Farms launched a watermelon juice into what they saw as a gap in the premium, fresh beverage market, as there was no other watermelon juice available in the United States. They named it 'Tsamma', in reference to the original name for watermelons in their African homeland. "'Tsamma' is the name of the Mother of all watermelon varieties," Frey explained. "It is thought that all watermelon seeds originated from the ancient Tsamma melon in the Kalahari desert in southern Africa. Thousands of years ago, the people in that area would not traverse the desert without taking Tsamma melons - and their juice - with them. They used the watermelon as a canteen and this inspired the way we juice and bottle our fresh watermelons now." Tsamma juice is made from watermelons grown by Frey Farms. They have also secured a wide distribution in a number of major retailers and foodservice distributors, and are available all year round. "We grow the watermelons that go into Tsamma juice," Frey said. "Our juices are available in 12oz single serve bottles, which can be found at Publix, Schnucks, The Fresh Market and Harris Teeter, year round. We also have seasonal Summer campaigns with Aldi, Tops Friendly Markets and Fresh Thyme Markets. We also offer watermelon juice in bulk to the foodservice industry." Tsamma is presented as a premium juice as it is cold-pressed from over 1 1/2 pounds of Frey Farms seeded watermelon. Frey said the juice is a great alternative to other beverages in this category such as coconut water. "We believe this category will continue to grow significantly," she said. 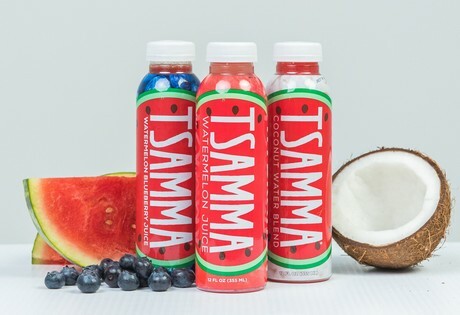 "Tsamma is very close to becoming a true rival to coconut water as the hydration beverage of choice. In fact, Tsamma watermelon juice not only hydrates, it contains high amounts of L-citrulline and Lycopene content, that increase the effects of hydration and cardiovascular support while providing antioxidants." "We currently have 3 Tsamma blends - our original watermelon, watermelon and coconut water, as well as a watermelon and blueberry juice blend," Frey continued. "Each juice has at least 1lb of cold-pressed watermelon, while the blueberry blend also contains one cup of blueberries. This spring, we will be launching a fourth blend - one that will fill a functional space. It will still be a hydration beverage, unlike a smoothie, however will be the first of its kind with a daily immune booster." Frey Farms will be attending Southern Exposure in Tampa this week with Tsamma Juice as the centerpiece. It's a show they find great value in attending. "Frey Farms have been attending now for 8 years," Frey said. "It's one of our favorite shows and is of particular value to us as much of our business is centered in the Southeast. The size of Southern Exposure is perfect and the SEPC takes great pride in who they allow to exhibit each year, which adds to the exclusivity surrounding the show. It feels closer and more intimate and you get a good amount of face time with customers." "At our booth, we will be showcasing Tsamma juice, our produce and our farms and processing centers," Frey added. "We will also be sampling Tsamma at the Tom Page Golf Tournament as part of our sponsorship of the event. It's a great opportunity for our juice to get into the hands of people in a real setting - as they participate in the event. This will enable Tsamma to shine in its intended use as a healthy hydration beverage." Tsamma Juice will be located at Booth 602 at Southern Exposure.